Jarkko Hartikainen’s EMBODIED: Violin Solo was commisioned by Eriikka Maalismaa and first performed in Avanti Summer Sounds in June 2018. Composer Niilo Tarnanen tells about his work UR: “UR (2017) for guitar and accordion has been inspired by the miracle of life. Vague earlier ideas for a guitaraccordion duo commissioned by guitarist Jonne Grans and accordionist Matti Pulkki gave way and became secondary when my son was born. In labour, my wife started humming a steady tone of relatively low pitch in order to relieve the pain. I found myself adding an octave, tenth, or twelveth below her voice in order to do participate in a meaningful way. The experience was profound and mundane at once. After some hasty sketching I soon met Jonne and Matti in order to test the acoustic qualities and instrumental aspects of the ’Ursatz’ of what would become UR. The formal idea of recombination and improvisation in a rondoish framework was refined during pram walks with the newborn. Enno Poppe’s Rad for two microtonal samplers is a classic. Poppe is one of the most noteworthy composers of our time, and even though his works are sometimes performed in Finland, Rad has not been one of them. Klemola’s brand new Etude 2 for two keyboard players contains some spectacular rhythmic fireworks. It serves as an introduction to Poppe’s work and receives its first performance in this concert. 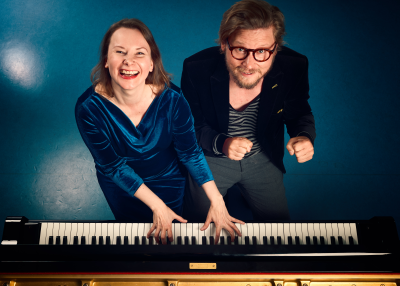 Tickets 17,5 / 11 / 6 € (including a service charge) Ticketmaster or 15 / 10 / 5 € from the Helsinki Music Centre Service Desk. Tickets go on sale shortly.